Nearly 3,500 people flee to neighbouring country raising concerns of new refugee crisis in southern Africa. Bestone Chisamile, Malawi’s commissioner for refugees, told Al Jazeera on Friday that with no end to fighting in sight across the border, his government had no choice but to takein the refugees and asylum seekers who continued to arrive daily. “We don’t have much of a choice. Most of those coming are women and children. We have to assist them on humanitarian grounds,” Chisamile said. Clashes have intensified in recent weeks, prompting an exodus from the area, following a pledge by Renamo leader Afonso Dhlakama in December that he would take six of Mozambique’s 11 provinces by March 2016. The UN said most refugees were arriving at Kapise, a village in the Mwanza district, around 100km away from the capital Lilongwe, while others had made their way to villages in the district of Chikwawa. On Thursday, the UN’s refugee agency (UNHCR) told Al Jazeera that as of January 20, a total of 3,477 people had fled to Malawi, with as many as 50-60 arriving daily.”We were not expecting these numbers. It suggests that people are not going to return any time soon [and] at this rate we could have between 5,000 to 6,000 refugees by March,” Monique Ekoko, a UNHCR representative, said. Malawi already hosts some 25,000 refugees mostly from the Great Lakes region in Dzaleka camp, some 35 km from the capital, Lilongwe. The camp is already stretched to the limit, and the World Food Program (WFP) has warned that a lack of funding will have consequences for those housed there. The WFP said they were forced to reduce food rations and suspend provision of foodstuffs over the past six months. “Refugees are only receiving 40 percent of the recommended minimum daily kilocalories, compromising long-standing efforts to achieve food security in Dzaleka camp,” the WFP said in a statement. Malawi has been particularly hard hit by a catastrophic drought in southern Africa. At least 2.8 million people in the country need food aid out of an estimated 14 million facing hunger in the region.Chisamile denied that the situation in Mwanza had reached crisis levels, but added that his government needed help to handle the numbers, especially to avert the possibility of an outbreak of any waterborne diseases, such as cholera. 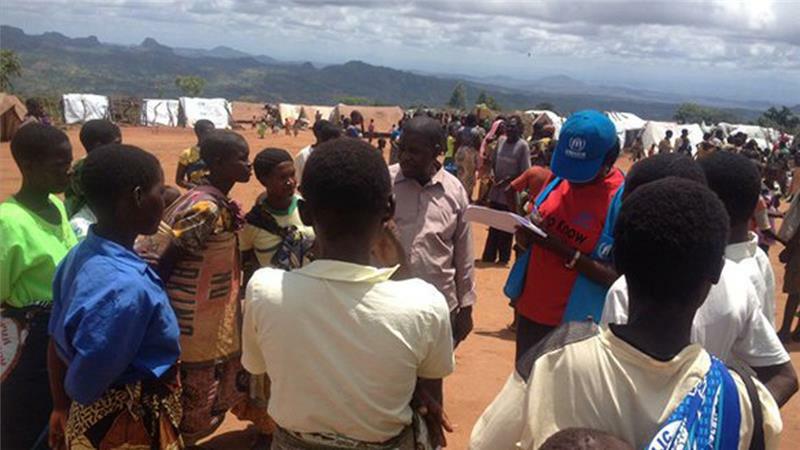 “I wouldn’t say its a crisis as yet; it’s not the first time Malawi has hosted refugees. Remember we hosted a million refugees at one point,” he said. Chisamile said his government was considering reopening the Luwani refugee camp, in southern Malawi, which previously hosted refugees from Mozambique’s civil war between 1977 and 1992. This is sad news to us as refugees all over the continent and Glob. Where those refugees will go? even how they UN plan to send them in overseas and there we had about big refugees crisis. African we are forgotten people in this planet who can stand for us and finish wars in Africa?